November, 2002 Michael Riese wins his first bid to become Del Norte County district attorney. He had previously served in the position on an interim basis after a previous DA stepped down shortly after winning an election in 1998. January, 2005 Jon Alexander is hired by Riese as a deputy district attorney, but is fired after four months on the job. According to court documents, Riese stated the decision was made because the State Bar had placed Alexander on probation. June, 2006 Riese defeats Alexander to take his second term in office following a rancorous campaign. November, 2009 The county's then administrative officer urges Riese to take time off over concerns about his prescription drug use and bizarre behavior in the office. She pens the letter, made public in a March of 2010 Triplicate story, a day after Riese is pulled over for a sobriety test but not arrested. He denies being under the influence. June, 2010 Riese tries for a third term in office but is narrowly defeated in the primary election for a run-off berth against Alexander. November, 2010 Alexander takes the district attorney post by a mere 196 votes after running on a "Death to Meth" platform. A recovering addict, his victory was touted as the ultimate redemption story. July, 2011 Alexander talks with a criminal defendant in a meth case without her attorney present, fails to disclose the conversation and lies about the incident. August, 2011 Employees of a Crescent City grocery store call 911 after Riese is observed appearing confused and disoriented. A responding police officer reports he calls Riese's girlfriend to pick him up because he is unable to use a cell phone. 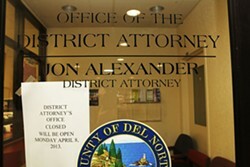 The case is handed over to the California Department of Justice. February, 2012 A jury acquits Riese, who represented himself, of driving under the influence, child endangerment and public intoxication charges stemming from the Safeway incident. April, 2013 A State Bar Court judge suspends Alexander's right to practice law and recommends he be disbarred for engaging in several incidents of prosecutorial misconduct. The Del Norte County Board of Supervisors suspends him without pay and Assistant District Attorney Katherine Micks takes the helm. November, 2013 A judge dismisses a separate driving under the influence case against Riese in connection with an April of 2012 arrest, according to Triplicate reports, which the paper states was filed after Alexander solicited surrounding counties for a prosecutor. 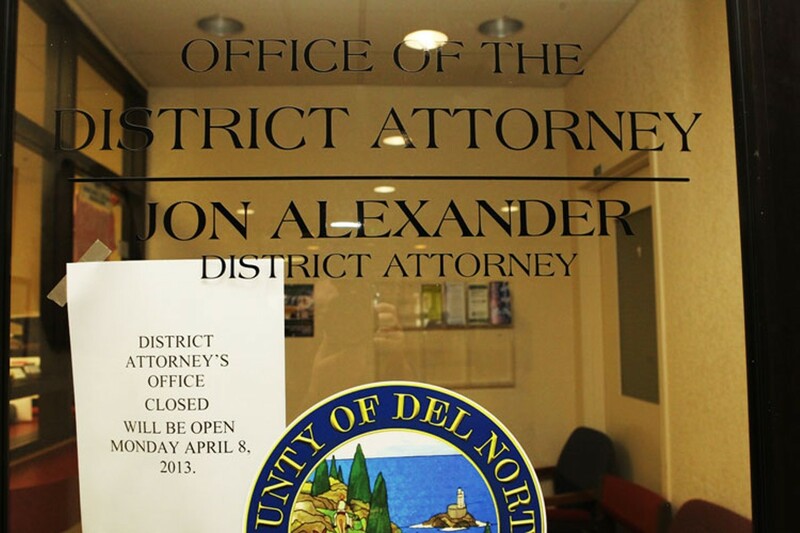 June, 2014 Dale Trigg is elected as Del Norte's next district attorney on a platform touting his fresh perspective and promises to run a principled, drama-free office. He is sworn into office a few weeks later. August, 2014 A federal judge dismisses Riese's civil lawsuit against Alexander and several county and city officials, which alleged malicious prosecution in the Safeway case. November, 2014 Alexander is formally disbarred by the California Supreme Court more than one year after a State Bar judge recommended his law license be stripped. The Review Department of the State Bar Court had denied Alexander's appeal alleging discriminatory prosecution earlier in 2014. December, 2016 An appellate court upholds a lower court's decision to dismiss Riese's malicious prosecution case. During courtroom arguments by attorneys one month earlier, a judge called Alexander's actions "reprehensible" and said it appeared he had a vendetta against Riese. June, 2017 Trigg suddenly resigns from office with a few hours of notice, saying county officials failed to address salary inequities despite promises to the contrary. A week later, Trigg is practicing civil litigation at a law firm in Springfield, Missouri, where he started his career 20 years earlier.